Happy Monday, everyone! I'd like to thank the always wonderful Rebecca of Tastefully Entertaining and my lovely co-worker, Jessica for their amazing guest posts last week. I loved the sophisticated stylings of Golden Glamour and the Wishes Party was an excellent suggestion for potential parents. Of course, thanks to those of you who wrote or commented with well-wishes during my absence - your thoughts are greatly appreciated. This year, we're lucky to observe Halloween on a Friday night - meaning a whole weekend can be reserved for tricks and treats. More ideas to keep your Halloween spirits up all weekend long coming all this week. Small children will be thrilled to pick their costumes and trick-or-treat from house to house, but what about tweens and teens who have outgrown the traditional Halloween activities? A "Hallow-Teen" or "Hallow-Tween" Party is a fabulous alternative. A killer iPod party mix, horror movie marathons or cool haunted house effects can create a mood of mature mischief older kids will love. - for tweens and teens, it's important to provide a fun tabletop that isn't too childish. 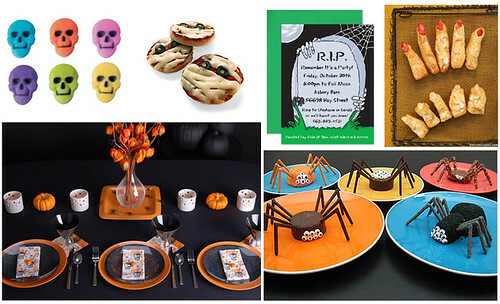 I absolutely love the Halloween table setting ideas from Hostess with the Mostess and find them adaptable for all ages.